So far, we have designed and produced a special key for the holidays– every single year in this century! No, wait-- every single year in this millennium! This year we combine a traditional camel-back lever with a translucent red knob, on a walnut base, for a stunning little key that will turn heads wherever it goes. The camelback provides for an elegant level transition down to the contacts but it also adds mass to the lever, making it smoother to operate. That and the added leverage that you get with the trunnion at the rear of the key make it an excellent key for sending code. The wires from the miniature binding posts are traced into the base and covered with a felt pad so the key will be less likely to slip, and won’t mar the table. The hardware is highly polished brass, gold plated so that it will not tarnish or corrode. Contact spacing and spring tension are both controlled by the single adjusting screw just forward of the trunnion, an arrangement that I have not seen on any other keys. It weighs 2-1/4 ounces (60g) and measures 2-3/8 x 1-5/8" (60 x 40mm) at the base. 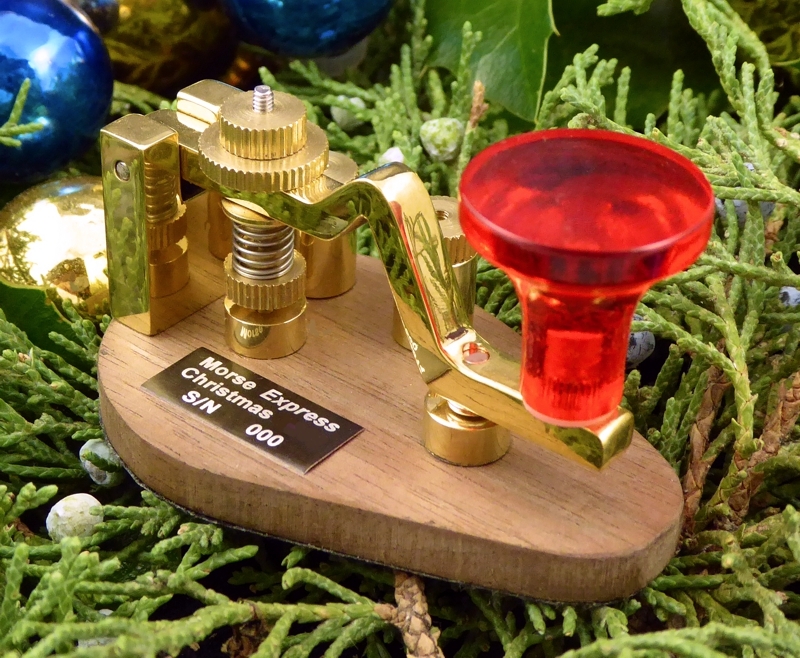 This is a miniature key that will be equally at home in the radio shack, in the field, or as a holiday decoration. The Christmas keys represent my annual opportunity to play around with key design and to have a master craftsman carry out the work. This year we agreed on gold-anodized polished brass mechanical parts and a translucent molded knob, and the result is really gorgeous with a depth of finish that really stands out. The two miniature binding posts are on the "far side" of the base, keeping the connecting cable tidy and out of the way. 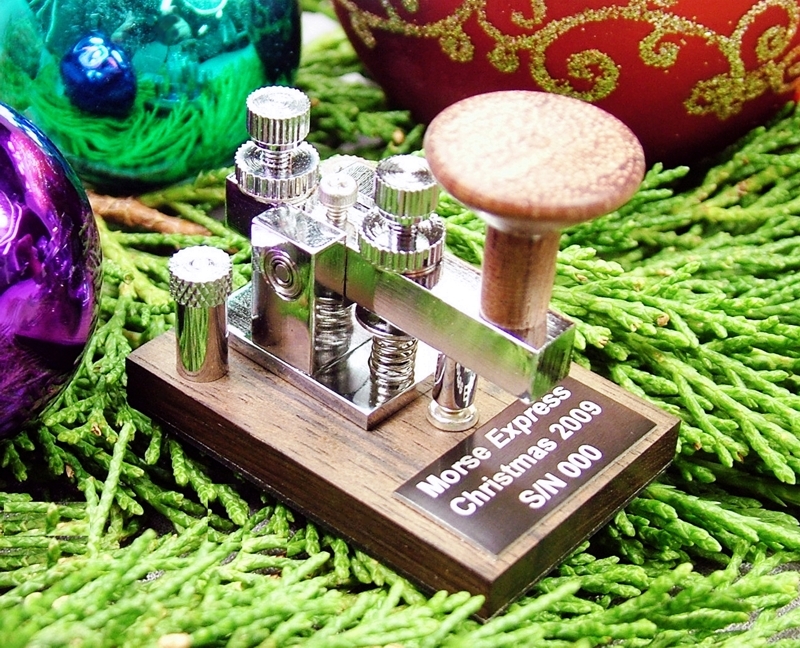 The Morse Express 2017 Christmas Key is a limited edition, priced at $89.95 plus shipping and handling. Each key has a label with “Christmas 2017” and a unique serial number. Thank you very much for your continued support of this project, and I hope our Christmas key brings a little extra joy to the holiday season for you!